“No representative of the Palestinian administration would ever take such responsibility. All the Palestinian officials used the peace process solely to increase their bank accounts. “The fact is that the population, which is called ‘Palestinians’ is an array of various urban clans which have nothing in common with each other, who even refuse to enter into kinship: Hebron residents do not marry with those who live in the vicinity, residents of East Jerusalem do not marry those who live in Nablus. So do the other Palestinian clans. “In the case of signing a treaty with Israel, all these decorations, called the ‘Palestinian people,’ will be dismantled. The residents of the autonomy will enter into internecine conflicts. This is what the leaders of the autonomy are afraid of. “In addition, an agreement with the Jewish state in the Land of Israel would be a de facto recognition that the Palestinian narrative is artificial, and its sole purpose is a war of Arab countries with the Jews under the banner of the struggle against the Zionist colonial grip. “This is the reason that the Palestinians in a completely infantile way deny any sign of authentic Jewish history in the Land of Israel, for example, the Jerusalem Temple or the kingdom of Israel. In their view, any archaeological find discovered in Israel is part of the Palestinian heritage and the Palestinians allegedly are descendants of the ancient Canaanites and Philistines who lived on this land. My Comment: What will help is only the people performing their mission, their purpose, which is to show the nations of the world the ascent to the next degree of human development through similarity to the Creator in the property of “Love thy neighbor as thyself.” We need to focus all our energy and attention precisely on this. Question: What is unique about what we can offer to the world? Answer: We can offer the world connection in which the Light is found. They will not actually discover the Light, but will feel above all that what we are doing is a blessing. Everything is working and advancing, there is some kind of grace that is attractive in this, there is success. It cannot be otherwise. If there is no picture of the goal, a form of the coming state, then you don’t feel it and don’t know where to advance. Imagine a child who is not instinctively developing through nature, instead he is only developing according to external examples that he sees in front of him. If a two-year-old child doesn’t see the example of a three-year-old child in front of him, he cannot grow to the level of the age of three. No matter how many blows they give him, he will not understand what they want from him. When we connect a person to the Upper Light and bring him an example, he gets an example of how he needs to be at the “age of three.” Now he understands this, is attracted to this, wants to grow, and activates his deficiency, the Reshimot. And when he grows up to the age of three, he must develop further, and blows alone will not help here. He wants to grow, wants to avoid the blows, but he doesn’t know what to do. He now needs to see in front of him an example of a child of four. And without us, this will not happen. Question: So are we offering connection to people as a goal or as a means? Answer: Connection is a means for building the right form of humanity, that within this form it attains its source in order to connect to it. This is called humanity fulfilling itself. All of its desires are fulfilled with everything required, like some kind of completely filled container. Question: How should we form our prayer? Should we start from a request to help the upper more, the fathers, the group, and mention myself only at the end? Answer: This is exactly how we should form our prayer and we have to learn that. But at the moment, you can turn to the Creator any way you like, as long as it comes from the center of the group. We will gradually format our collective appeal correctly. A prayer is not a simple appeal. You will have to place yourself in an increasingly more accurate manner that is established by several steps. Each appeal is a whole chain of adaptors, of connections, which at one end connects to you, then processes your request several times and makes it adaptable to the upper level. It is a whole system. A prayer isn’t just words, but the order of two vessels (since a letter is a vessel), which on the one hand, are adaptable to you, and, on the other hand, to the Creator. You have to build this chain, starting from ZAT of Bina that takes care of you, until Malchut, in which you are incorporated when you rise from the system of the worlds of the shell. In order to do that, you have to use the 22 letters of the (Hebrew) alphabet correctly and the five final letters “MNTZPCH”, so that your prayer in the form of the spiritual vessels, which means that is made of the letters that are correctly arranged, will attain the Creator (God), ZAT of Bina. We don’t know how to do that, but we gradually form our prayer by our experience. Kabbalists who lived during the time of the Temple prepared the Siddur (book of prayers) for us. The time of the Temple was the time that the Holy vessels existed, in which Malchut and Bina were connected, which is called the house of Holiness, the Temple. A house is Malchut and a Temple is Bina. The great Kabbalists of that time made up the great Knesset (assembly), which means that they were connected into one vessel and were on a level of greatness, in great spiritual attainment. They are the ones who wrote the Siddur for us. We will attain these prayers some day, but Kabbalists wrote them for us in advance. If we express them, whether we understand them or not, thinking in this direction, we still advance. If we read the prayers correctly, which means that we perceive these appeals in a spiritual manner, we can see great things in them. Kabbalists express their appeals in two ways: one through words, which means in a sequence of letters, and the other in the form of symbols, simply letters with a filling. The form of every letter is a whole HaVaYaH, which means ten Sefirot, with a special Reshimo (spiritual gene), in a special state, and this is why they wrote the prayers. My work is how to adhere more to the group, to the Rav, to the books, to dissemination, to everything that is relevant to the Light. There are no other means, but these are enough. Question: When the Light illuminates us, it is easy to be disengaged from our ego and look at it from the side. But what can I do if things are bad for me and I am entirely within my ego? Answer: If things are bad for me within my ego, why don’t I use this to help me to get away from it? Answer: It hurts because you are stuck in this feeling. Why can’t you disengage and leave it so that you can look at it from the side? This is the whole difference between the path of Torah and the path of suffering. If I don’t prepare myself, I become stuck with a bad feeling. But if I have prepared myself, then the bad feeling helps me to disengage and get away from this bad feeling and adhere more to the group. This is the dividing point between the two ways. Everything depends on preparation. Then I accept bad things as good, as gifts, and I bless them. I don’t need to artificially bless the bad as well as the good . Rather, both the bad and the good help me to run forward. It is as if I am sick and feel pain; this helps me to turn to a doctor immediately and show him exactly where it hurts. We suspect that I am sick, but we cannot determine where the painful area is. So the pain shows me the problem area, so I am happy about the pain. I go to the doctor and show him where it hurts me and then he heals me. So I see a sign of advancement, of healing in the pain. Without it I would not be able to advance. I don’t feel the pain itself, except as an indicator of correction and advancement; and I am happy about this! This pain is felt completely differently, since it is not felt as pain and suffering, but as a sign. It is all the subtlety of a psychological perception in the mind. Try to relate to it in this way and you will see that there are no pains, but instead, there is a traffic light that turns red. Everything depends on my relationship to this traffic light. Sometimes I am angry at it and am ready to kill it, and sometimes I perceive this in a relaxed manner, only as a sign. I even want this pain to come me, “I awaken the dawn.” To me, signs of malfunction are desirable because then I advance through them. My work is how to adhere more to the group, to the Rav, to the books, to dissemination, and to everything that is relevant to the Light. There are no other means, but these are enough. Question: What should our intention be when we read The Book of Zohar? Answer: When we study different sources, we discuss our desires, problems, successes, and failures. Now we begin to read The Book of Zohar in order to discover all our deficiencies: those that we feel and those that we don’t feel, the conscious and the unconscious, the exposed and the forgotten. We want to correct all that. What is correction? We don’t really understand others and are quite confused. Where is the correction supposed to come from? We don’t know and it is concealed from us. Therefore it is called merit. We simply ask for correction and that’s it! When this happens we will see what it means. But we can already ask, like a baby whose mother understands when he cries and gives him what he wants or needs; although he cannot express his request by even one word, she understands what he needs by his voice. It is the same with animals. On the whole, on every level, the lower level doesn’t know and cannot understand the upper level. The request of the lower isn’t realistic and is of course, incorrect with regard to the upper. But the difference between the levels compensates for this flaw and corrects it. So it makes no difference if our request isn’t clear and isn’t expressed correctly. It is still accepted. There will always be a gap between the upper and the lower who cannot ask for what the upper has. If we had the desires of the upper, we would already be in His place. I have my own desires and I only need to ask in order to receive. The request of the lower from the upper is compatible with the abilities of the lower, and the response of the upper is compatible with the abilities of the upper. The difference between them is called merit. It is impossible to feel the influence of the merit directly. A person performs many actions: he works in the group, in dissemination, in the kitchen, prepares the room for the lesson, and it is clear to him that he invests his own powers here. But when he simply sits and listens to what is read, it seems that nothing happens. Here we need faith in the sages, according to which there is no stronger source of Light than The Book of Zohar. We don’t see and don’t feel it, but it’s real. We simply have to keep on reading it, even half an hour a day, and it works. Let the Light operate in you. We only see the outcomes in our desires, but we don’t know how the Light works. It is like electricity that we don’t actually know, but if we connect different appliances to it: an engine, a lamp, or a measuring device, we will see that electricity is flowing in the network. But it is invisible in and of itself, and we discover it only by its actions. Therefore, it is called the force that operates in the created being who is managed by this force. The system of Adam HaRishon (First Man) consisted of one desire which later was broken and divided into 600,000 pieces, like a puzzle. All of these parts are now separated by various obstacles in that they do not feel their connection and do not want to be connected. They hate and repel one another. We can see this from people’s behavior in this world. We have to correct this disconnection and become connected. First we study our breakage, and after that we study the opposite, connection. We begin to get to know the Creator and His actions from comparing these two actions. This is called “knowing the Creator through His actions.” As a result of our study, we elevate ourselves to the level of the Creator. We understand the thought of the creation, its purpose, and everything from the beginning to the end. We elevate ourselves higher than the creation. The entire creation, everything that has happened to it and will happen, exists within this square, this puzzle. If we know how to match the parts of this puzzle, how to connect them together, we come to know everything about the creation and the Creator who created it. All we have to do is to put this puzzle together. When we come to a convention, we find ourselves in the company of people who are strangers whom we have never seen before. We don’t feel and don’t understand each other, but this is not important. If I know that I must connect with others in order to connect to the Creator, then I can enter any group. It doesn’t concern me who is sitting there, from what country they come, or even what language they speak. The main thing for me is to participate emotionally and internally in this circle. It is not important to me if we are speaking the same language and we know each other well, if we are close friends or seeing each other for the first time. This doesn’t change anything. The main thing is to rise above our ego and to want to be integrated into their circle in order to attain unity and through it, to let the Creator hear what we want. Nobody thinks about himself. There is no me! Everyone must feel that the rest of the friends are greater than himself (I < 9). In everything, the friends are higher than I am and I disappear in them as the smallest. 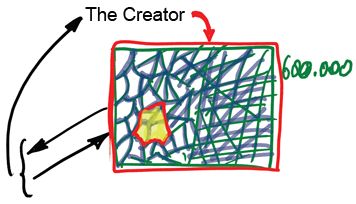 Connection above all of our particular, personal characteristics is the Kli (vessel) in which the Creator is discovered. 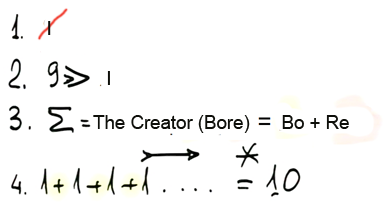 For the Creator (Bore) is “Come and See” (Bo Re); this means that we reach this state and find the Creator there. So our Kli is equal to the Creator. To the degree of the intensity of the Kli, its power (Bo), I can discover the Creator (Re). There is no measurement of the Creator. We don’t know His true measurements. But we discover Him according to how much we have prepared our Kli (Bo): to this degree we see Him (Re). At the time of the workshop nobody disagrees with the opinion of another. There are no questions: Each one only adds (10 = 1 + 1 + 1 …). What is important is the pluses and not the ones. The one whose turn is next only adds to the previous one, and nobody argues. Even if I haven’t succeeded in rising above my critical attitude and it seems to me that someone else said something wrong, I must immediately correct myself. If I hear that a friend said something wrong, this means that I am not okay. So everyone only adds and adds to what was said by the others. Someone can give some kind of conjecture, I continue, and then comes the next one in turn. So we constantly add. There are no great or small in our connection, all are equal. It doesn’t matter what kind of seniority one has in a group, young or old, or more or less understanding. Among all of our physical characteristics in this world there is nothing that can violate our equality. In the spiritual world, all of us are equal, like children to their mother. This article is written by my student, Michael Brunstein. Mind-boggling events continue happening throughout the world. Particularly, we are deeply shocked because of the recent severe conflict between the Ukraine and Russia. Just a little while ago, this situation would seem much more unfeasible than the invasion of Earth by aliens. And yet, it is in fact going on as we speak. The world’s mass media constantly comments on this situation. The main question they are discussing is: What is the reason for the mutual hatred between the two brotherly peoples? Confrontation between the two countries triggered brand-new terms such as “green men…” However, nobody has yet mentioned that the roots of this animosity are hidden in the supernatural. At the same time, the world is overwhelmed by another round of hostility. It causes less social resonance, but for forty centuries, no clear explanation of the phenomenon has been found. By who, why, and in what way are the Jews hated so much? It is a hopeless and unproductive topic. Everybody is tired of this discussion. The answers to these questions do not resolve the problem since they don’t address the main issue: What is the reason for the world’s animosity towards the Jews? It’s time to acknowledge that the fact that the Jews are still alive speaks about some phenomena that are not random or natural like gravity or the wind. Our attitude to the Jews can differ, but the fact that there is a “special” attitude to them demonstrates that the Jews are a one of a kind phenomenon. Let’s bring up a question: what is the main distinctiveness of the Jews? Is it just having numerous Nobel Prize laureates, musicians, bankers among them? Yes, the Jews are known for their achievements in these fields. It’s hard to argue with this fact. However, there are bankers, laureates, and even great chess-players that come from other ethnic backgrounds. So, the main secret must be hidden somewhere else. Surprisingly their “terrible” secret doesn’t have to be unveiled since it is already open to everybody without exception, both to Jews and non-Jews. This secret can be shared with everybody without triggering negative consequences. In order to reveal this secret, there is no need to go far away or pay a huge price for it, or obtain somebody’s permission. Everybody is supposed to know what the secret is about, and yet nobody understands it. It has no weight, but it’s hard to carry it. It is very attractive, but there are none willing to look at it. It is the most valuable thing on earth, but nobody wants to get it even for free. It is right in front of us, but we don’t believe it. We cannot give it as a gift, nor can it be accepted as a present. The Jews haven’t used this secret in a long time, but they continue paying for it. The payments are not straight or even, but they are made on a regular basis. The price for the secret it’s simple: it is called anti-Semitism. Anti-Semitism is not an accident or a whim. It emerged at the same time when the Jewish people and their father Abraham appeared. The law “Love Thy Neighbor as Thyself” that is the foundation of the Jewish nation gave rise to the “mirror” law – anti-Semitism. How are the ethical principle “love thy neighbor as thyself” and anti-Semitism connected? Let’s explore this issue from a realistic platform. It’s very doubtful that there are people in the world (except complete idealists) who think that this ethical principle is consistent with human nature. Recent world events serve as a brilliant proof of this fact. They are unfolding as we speak. In essence, the world is caught in a deadlock. But this is utopia, everyone will unanimously exclaim at this point, and they are right. Today, it is not possible, nor was it ever feasible in the past. And yet, there was one exception in the history of humanity: the people of Abraham. Many times, the people of Abraham proved that it is possible to love their neighbors as themselves. Of course, this state of affairs didn’t last long; short periods of brotherly love were replaced by extended years of mutual animosity. However, if the state of loving our neighbors could last for one month or even one day throughout the millennia, it is worth giving up everything we ever had for that. Because it is so unrealistic, humanity will never accept this burden onto its shoulders. The principle, which is impossible to follow, is laid in the very foundation of our civilization!